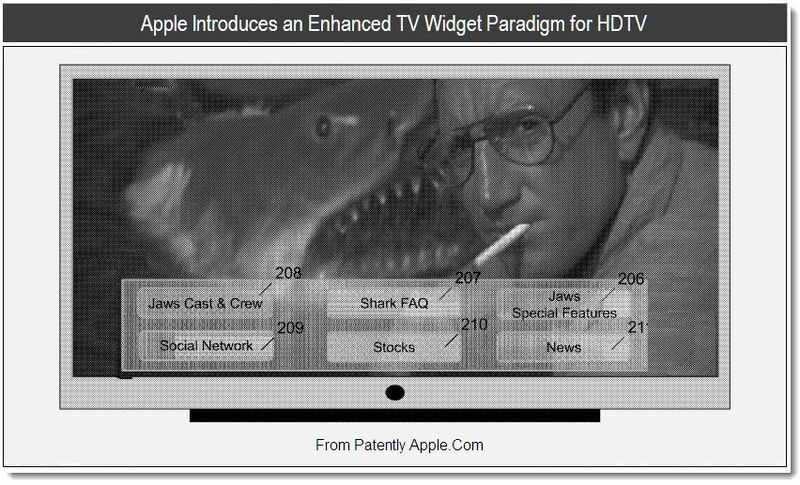 An enhanced TV widget paradigm in which widgets are capable of being content-aware and thus capable, among other things, of automatically (i.e., without intervening user input) providing the user with access to information or other resources that are complementary or otherwise relevant to the media content currently being presented by the TV set to the user. For example, U.S. television viewers could someday use this type of technology to vote for their favorite American Idol contestant in real time via their television. Or, Jaws viewers, for example, would automatically gain access to a Jaws Trivia app that would magically appear when you begin the program. This is amazing stuff and seems to be further confirmation Apple is intent to become a bigger player in the TV Room. This follows a reported earlier this week that suggests Apple will soon reveal its first iOS-powered television display. Thoughts?